With every week that passes, I think of new names to add to my list of influences. But the thinkers shown in today’s effort are those with the names that I carry around in my head — writing them down as a reminder is not needed. Today, I will write about Dr. Robert Higgs, Henry Louis Mencken, and Mark Twain, whom I have mentioned, probably, in reverse order of each’s world renown. Is there anyone on the planet who has not heard of Mark Twain? He very well could be the most famous American. H. L. Mencken should be known everywhere that humans engage in thought. And I have a reasonable expectation that some day, Dr. Higgs, who is now slightly younger than I, will have fame among a wider scope — he is currently well-known among most people who champion voluntaryist principles. He lives now in Xcalak, Mexico. I discovered him while he was still in Louisiana, USA before he retired. But I follow him every day. He posts regularly on Facebook. Of all the current stars in the libertarian/voluntaryist/Austrian economist/anarchy firmament, his is the brightest, to me. I’m talking about comparing him with Ludwig von Mises, Frédéric Bastiat, Murray Rothbard, Lysander Spooner, Henry Mencken, Harry Browne, Don Boudreaux, Walter Williams, Lew Rockwell, Henry Hazlitt, Sheldon Richman, Scott Horton, Skyler J. Collins, too many others to mention, … even Tom Woods. Bob Higgs is the man who writes among economists as Robert Penn Warren wrote among novelists. He will be famous, if for no other reason, for his exposition of the Ratchet Effect. The Ratchet Effect concerns itself with the idea that each time government finds an excuse to expand, when the excuse has expired the expansion remains (see Homeland Security). The Pentagon is a monument to the Rachet Effect. At any level of government, one can find a dizzying array of agencies that must have seemed like a good idea at the time. The trouble is that these agencies never go away, remaining permanently and independently of the initial intent. Can you name a compartment of government that has gone away? Not so fast there. It cannot just be subsumed into another agency. We may have outlawed something like dueling, but if it had been regulated by an agency, that agency would have been a survivor of every duel. One of economic historian Bob Higgs’s outstanding contributions is the “ratchet effect.” During a crisis, the size and scope of government grow tremendously. After the crisis subsides, government shrinks, but not to the precrisis level. In consequence, leviathan expands over the decades, leaping from one crisis to the next. … We see Higgs’s thesis of the ratchet effect on brilliant display with the Federal Reserve in the wake of the financial crisis of 2008. Every year, on Veterans Day, orators declare that our leaders have gone to war to preserve our freedoms and have done so with glorious success, but the truth is just the opposite. In ways big and small, direct and indirect, crude and subtle, war—the quintessential government activity—has been the mother’s milk for the nourishment of a growing tyranny in this country, and it remains so today. Following the Equator is not Mark Twain’s best book. It would be hard to pick one, and even harder to not pick Huckleberry Finn. But I think the passage that most affected me in a Twain book was his account of the genocide, the total annihilation, the complete eradication, the wholesale murder of the natives who lived on the islands of what are now called Tasmania. These were indeed wonderful people, the natives. They ought not to have been wasted. They should have been crossed with the Whites. It would have improved the Whites and done the Natives no harm. But the Natives were wasted, poor heroic wild creatures. They were gathered together in little settlements on neighboring islands, and paternally cared for by the Government, and instructed in religion, and deprived of tobacco, because the superintendent of the Sunday-school was not a smoker, and so considered smoking immoral. The Natives were not used to clothes, and houses, and regular hours, and church, and school, and Sunday-school, and work, and the other misplaced persecutions of civilization, and they pined for their lost home and their wild free life. Too late they repented that they had traded that heaven for this hell. They sat homesick on their alien crags, and day by day gazed out through their tears over the sea with unappeasable longing toward the hazy bulk which was the specter of what had been their paradise; one by one their hearts broke and they died. In a very few years nothing but a scant remnant remained alive. A handful lingered along into age. In 1864 the last man died, in 1876 the last woman died, and the Spartans of Australasia were extinct. 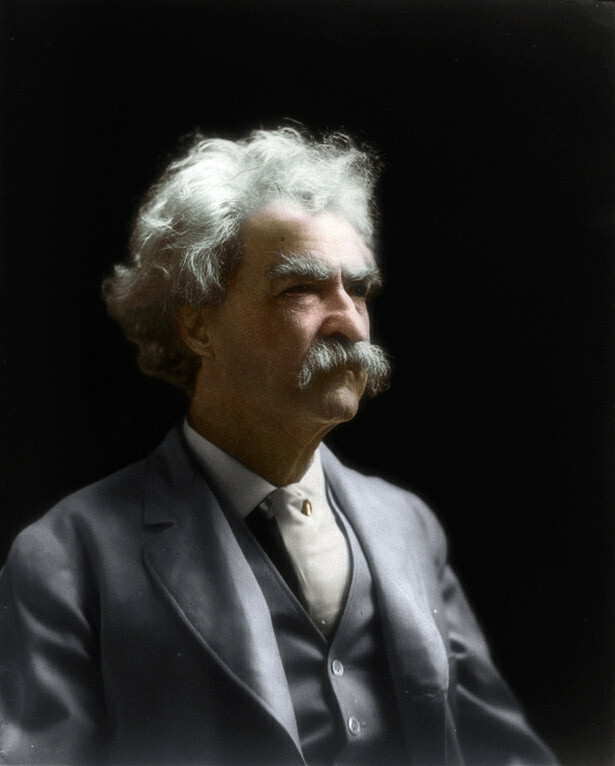 Mark Twain was anti-imperialist, anti-interventionist. It was through my lifelong reading of his works that I developed his sense of the absurd when it came to man’s inhumanity to man. Most stories about genocide of a small but valiant vestigial remain, are absurd. One subspecies does not need to wipe out another subspecies for the latter’s survival. At worst there may be a semi-important difference of economic schema — a clash between styles of possessing. But it is absurd that one element must obliterate the other. I cannot remember when my favorite saying, of all of those of all of the wits in the world, became H. L. Mencken’s observation that ” … there is always a well-known solution to every human problem — neat, plausible, and wrong.” But I do know it was the day on which I changed my view of the world. It was also the day upon which I became an avid reader of Mr. Mencken’s work. Henry Louis, this great titan of journalism from Baltimore, seemed then and seems still among the brightest human minds, ever. If a gigantic reason such as that held by this man saw many problems as too complex for neat and plausible explanations, then life must really be about complexity. Life is not simple, humanity is not straightforward, human nature is not easily unpacked, and human error has confounded for ages. Some will say that Mencken was just a cynic. But there is not a hopeless misanthropy here (a trait he shares with Twain), how could anyone write so eloquently of the endless pageant, as beautifully and as long as did Mencken, and not in the end be guilty of holding out infinite hope that someday we would catch on? Could it be that on some bright day we would stop being so half-baked about everything? I Will “Appropriate” Your Culture! You mention Tom Woods as if he was an afterthought. I could be wrong as to your intent. What is your opinion of Wendy McElroy? There are few people I am a fan of and Wendy McElroy is among those few. Tom Woods is certainly not an afterthought. It’s just that I might be preaching to the choir a bit at a site called “Everything Voluntary.” I actually think that Tom’s very vigor places him in any forefront of our movement. I revere Wendy McElroy as well, but I have not been as exposed to her work as that of Tom Woods. Also, I wrote more extensively on Tom a while back here.